They have been planning for at least 6 months now what costumes they would choose for Halloween. Em was pretty set on Minnie Mouse, and she was going to wear this dress I made her for her birthday. A was going back and forth a lot, but had pretty well settled on Captain America. 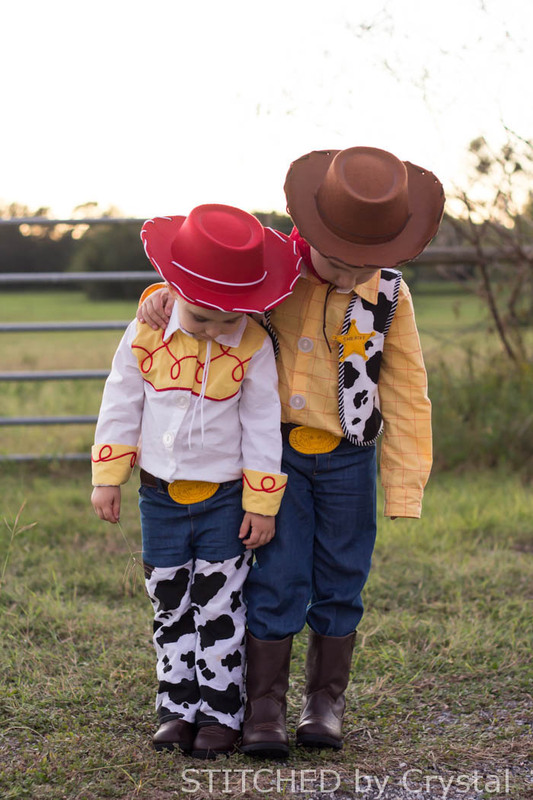 Then with a last minute change of heart, they decided to go as Woody and Jessie from Toy Story. I was pretty thrilled with them picking coordinating costumes. Seriously...how cute are these two! And of course since they coordinated, I have to get the whole family in on it! My husband isn't crazy about costumes, but I have him talked into to dressing up as Buzz Lightyear (but just a t-shirt and some wings, nothing too crazy) and I am working on a Mrs. Potato Head costume for me. 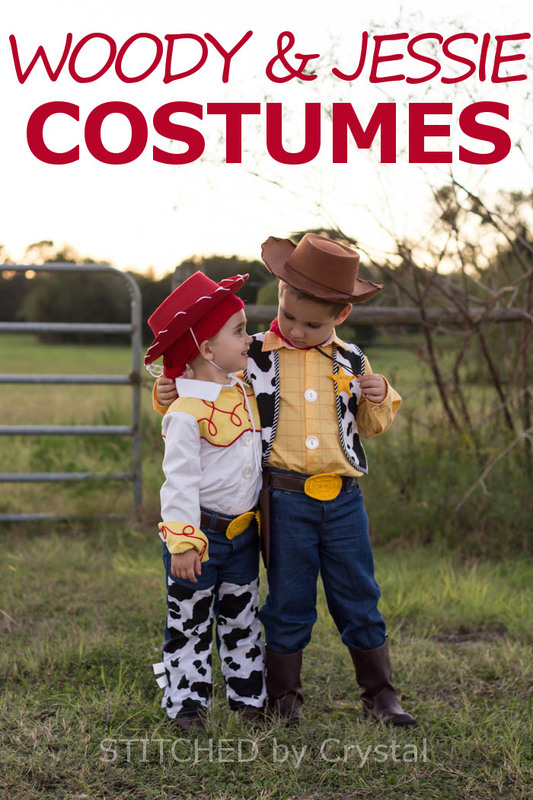 Let me tell you about their costumes! I made everything except the hats and boots. The boots I picked up at Walmart, super cheap. 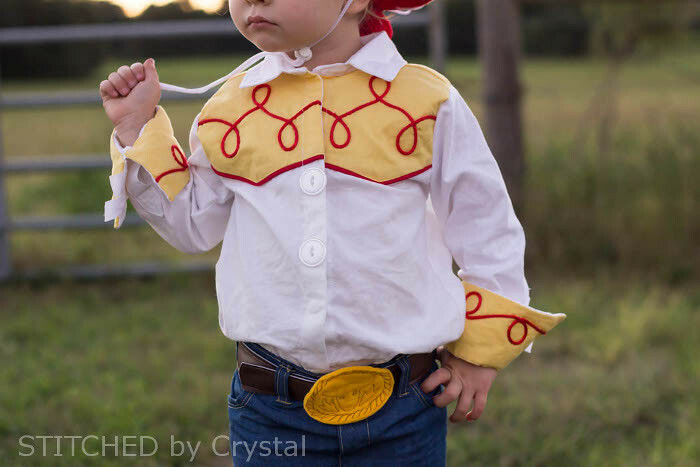 And I found this Woody hat and this Jessie hat on Amazon (affiliate links). The hat came with white string on it, but I swapped it out for some brown sting I bought at Hobby Lobby so it looks a bit more like Woody's hat. Then for their pants, I bought the lightweight denim and cow print at JoAnn Fabrics and used I modified the Small Fry Skinnies pattern by Titchy Threads (same pants I sewed HERE). I modified the pants to have an elastic back waist and faux fly, but kept all the great jeans details like the pockets, yoke, and topstitching. For Jessie's pants, I made them more of a boot cut than a skinny pant and sewed the chaps right into the front of the jeans. Then I added some 1" white ribbons to the side seams for the fringe. They also each got brown vinyl belts and felt belt buckles. The belts close with D rings and the buckle is glued on top. For the belt buckle detail, I sketched out my design then free motion stitched it onto 2 layers of felt. In hindsight, I think I should have added some king of stabilizer between the layers of felt. 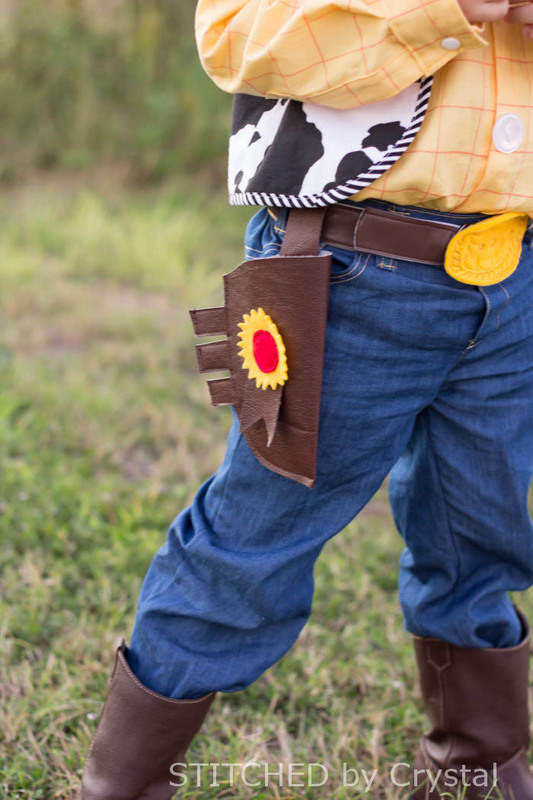 Woody also got a vinyl holster with some felt details on it. For Jessie's shirt, I used the Classic Oxford pattern by Peek-a-boo patterns (which I made once a couple years ago). I added the front yoke detailing and changed the shape of the yoke a bit in the back, I used some polyester trim for the red yoke detail and sewed it on with a zig zag stitch. And I added some red piping below the yokes. I also lengthened the sleeves and modified the cuff a bit to it could be turned up and flare out a bit. The cuffs got the same polyester trim details. The shirt closes with snaps that are hidden in the hem allowance and I added two big decorative buttons. 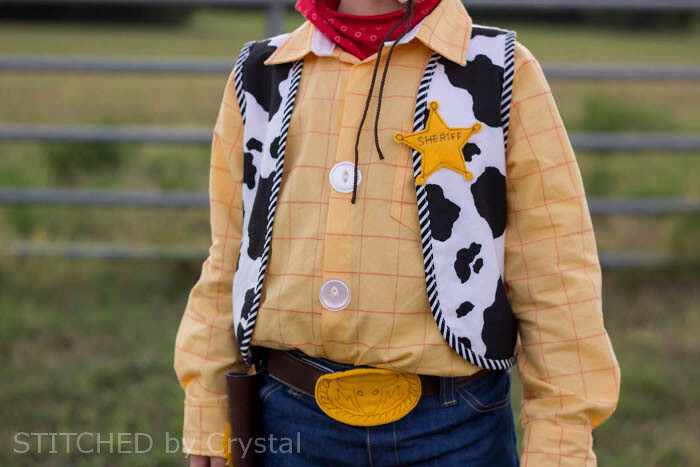 Woody's shirt is also made with the Classic Oxford pattern by Peek-a-boo patterns. I couldn't find the perfect fabric, so I bought some plain yellow and drew the red checks on with red fabric marker. 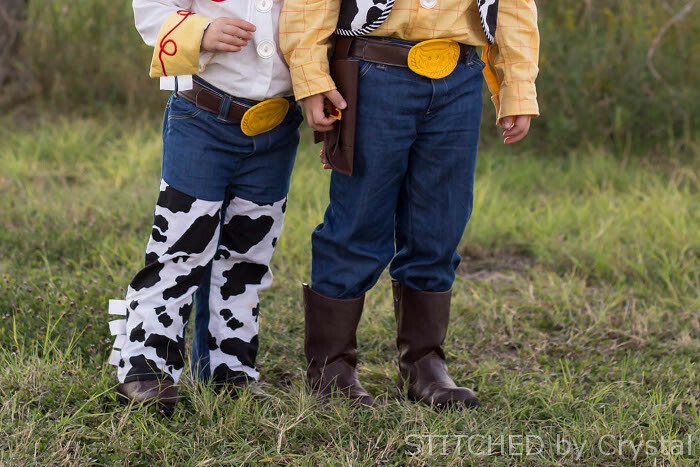 I drafted a pattern for the vest and sewed it up with the same cow print I used for Jessie's chaps, Then I trimmed it with some striped bias tape, Hobby Lobby had the perfect tiny stripe fabric to make the bias trim. I used the same free motion technique I used for the belt buckles to make his Sheriff badge and stitched that to the vest. I spent a several days trying to convince my kids that Em would be a really great blonde Jessie, but they both insisted she needed red hair. So I made her a red yarn wig. I had some red nylon left over from last years superman costume that I used to make a tight fitting cap. Then I stitched some red yard right down the middle in the front and some straight across the back. 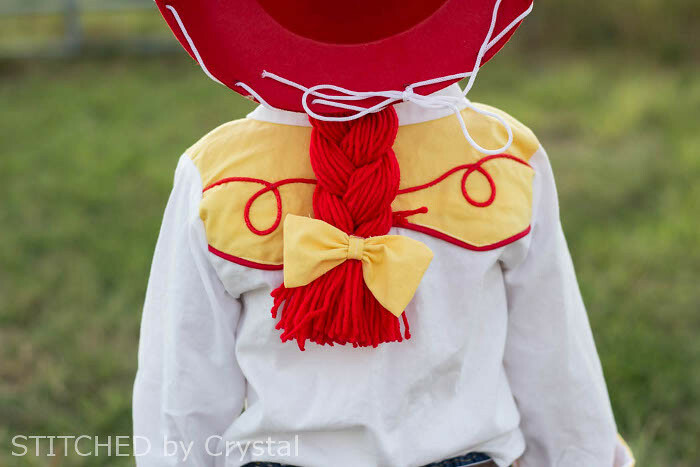 I pulled the hair back to a braid and added Jessie's yellow bow. This was my first time making a wig, and it has a few bald spots, but the get covered by the hat! Phew! And there you have it! 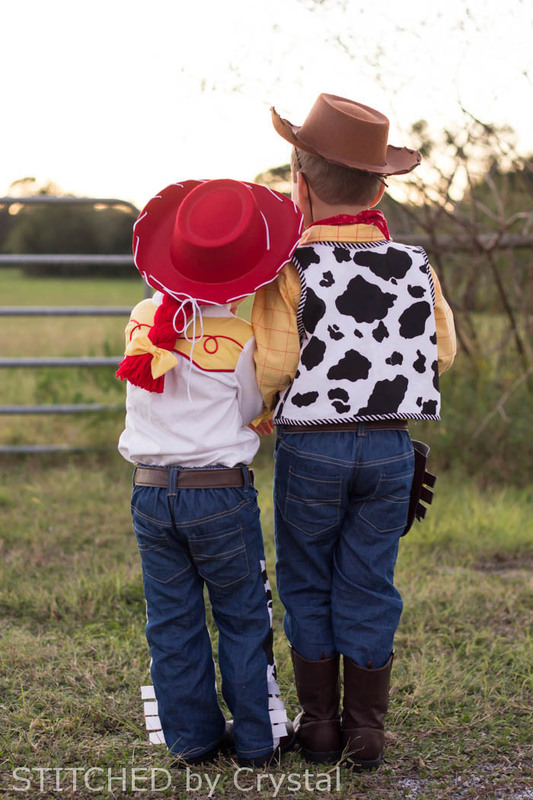 One Woody and one Jessie! 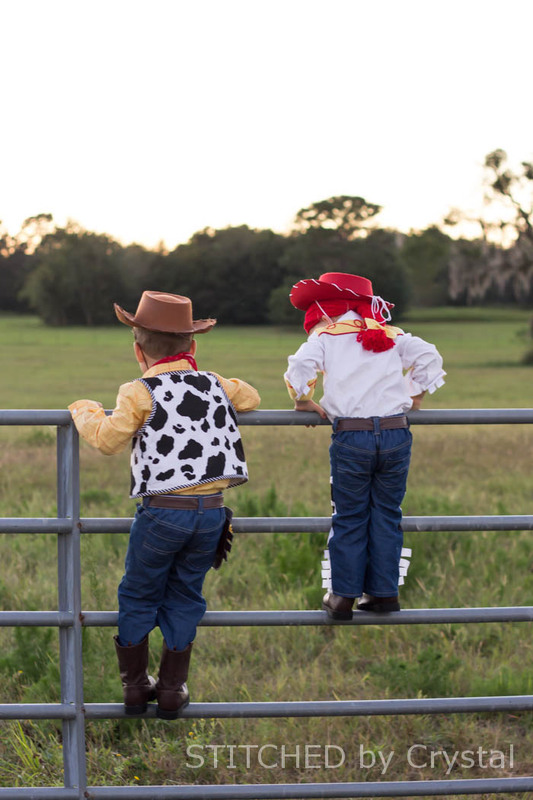 I had so much fun making these costumes, and seeing my kids get excited about them too make it so worth the effort! I think these are my favorite costumes yet! How will I ever top these next year?! would you make these costumes for purchase? 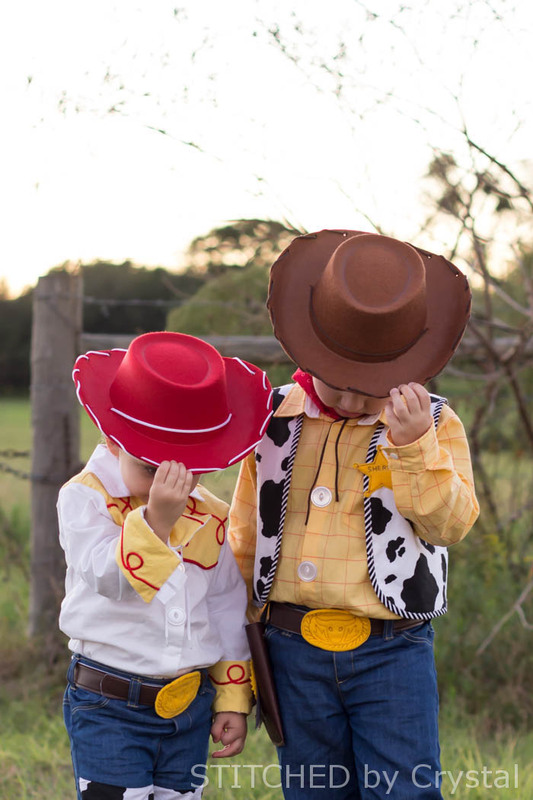 i have twins that we want to dress up as jessie and woody!!!!! 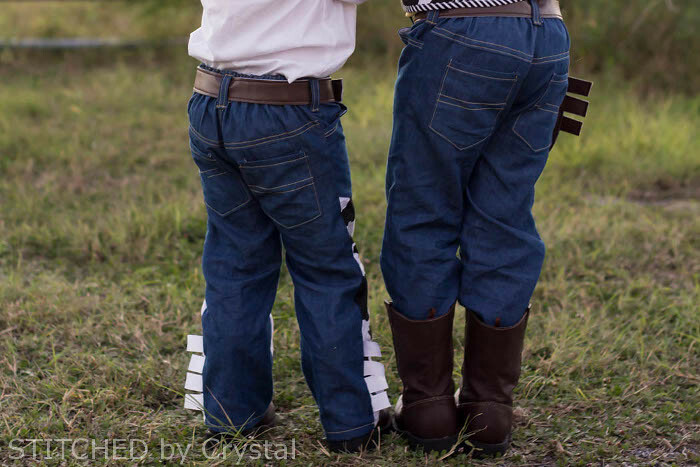 these are the best costumes I've seen!!! they are just perfect!!! !